Metatarsalgia is the most common cause of ball of foot pain. Unfortunately, this condition cannot always be avoided, even if you are exceedingly careful. Athletes, particularly runners, gymnasts and dancers are predisposed to develop metatarsal pain simply because of the nature of their work. Being overweight or obese can also make you more prone to having ball of foot pain, but these factors are simply a few examples of the most common reasons. Metatarsal Pads: 10 Best Products! 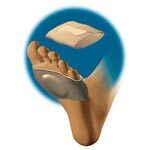 Unlike insoles, metatarsal pads are geared toward consumers that have centralized pain in the soles of the feet. If you like to wear high heels or jog for hours at a time, the pain that you can experience in the foot pads can be completely debilitating. Thankfully, metatarsal pain can be easily managed by wearing a pair of the top 10 best metatarsal foot pads listed below.